Pansies are one of the earliest flowering plants, blooming right alongside the spring crocuses and other flowering bulbs. Many varieties of this delicate flower have coloring that make them appear to have a "face." 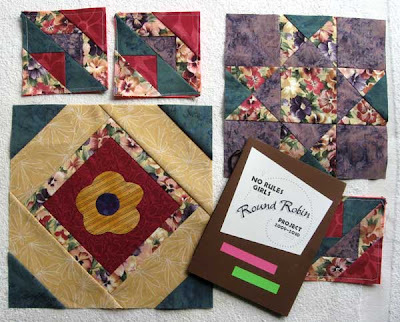 The pansy fabric included in this Round Robin package was accompanied by blueviolet and forest green textured fabrics with a request for a "pretty, feminine, soothing" quilt. Two of us have added rose-colored fabrics to this palette, which brings out the warm pinks and peaches of the flowers—very pretty and romantic. The name "pansy" comes from the French word, pensie, meaning "thought" or "remembrance." I think the quilts made from our Round Robin Project, as well as messages in the accompanying Quilt Journals, will be a sweet and thoughtful remembrance of all the participants. We have a very special group.